Bottlest, together with our parent company Terravant, is the largest winery in Santa Barbara wine country and one of the largest in the entire U.S. with an annual production capacity of more than 1 million cases. 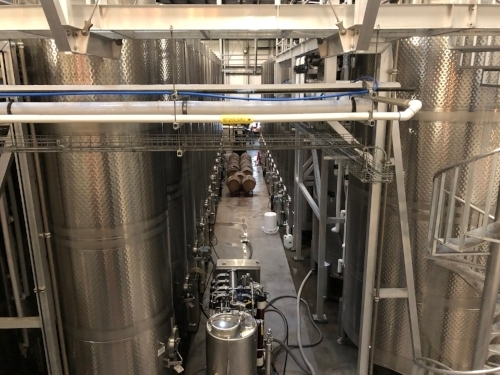 While we do have our own wine brands such as Bottlest, Compilation, and Insomnia, as a "custom crush" winery our primary business is “behind the scenes” making wines and developing brands on behalf of other wineries, retailers, restaurants, and wine clubs. Visit us 7 days a week for a tasting or for a guided tour of our state-of-the-art production facility and barrel room where you’ll learn about the winemaking process, taste six different wines, and create your own personalized wine to take home! Don’t have enough time to do the full tour? No problem. Stop by our winery tasting room for a flight, or continue your tasting adventure at the automated “Wine Wall” in our bistro, featuring an ever-changing selection of 50+ wines automatically poured in increments of 1 oz. (taste), 3 oz. (half glass), or 6 oz. (full glass).